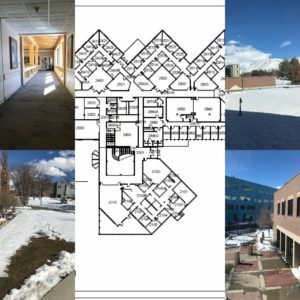 Though its foundations dig into the hillside, and its pipes weave further underground, the University of Utah campus is a façade of colonial time overlaying the ancient geologic scales of Basin and Range. Not even the descendants of the first Mormon settlers have roots deep enough to remember the last time the Wasatch Fault slipped. I suspect those who settled the valley in the nineteenth century didn’t ask the indigenous tribes if they remembered any such earthquakes before they massacred, oppressed, and named their state after them. Excepting the geologists, most folks who have walked, lived, and worked on campus have never been aware of the minute accretions of tectonic pressure building under the foundations of these buildings, or that they have produced major earthquakes in the past and threaten to produce another in the near future. The Utah Seismic Safety Commission reminds us that “the infrastructure we rely upon can be fragile in ways we may not understand until after it is damaged or disabled in an earthquake.” It’s very difficult to know what will happen to a building or a city when an earthquake happens, especially in a place like Salt Lake City where none of the buildings have ever been tested by a major earthquake. While places like San Francisco and Los Angeles have seen what happens to their buildings, bridges, and freeways when earthquakes strike, Salt Lake doesn’t have that infrastructural memory. Settlement and development of the Salt Lake valley occurred over a period of relative stability, a temporal coincidence that hid the seismic dangers of the fault until geologists were equipped to speculate about the deep past using paleoseismological methods. It wasn’t until 1996, after LNCO (Language & Communications)was completed, that Mccalpin and Nishenko published the first probabilities for an earthquake of magnitude 7.0 or greater along each segment of the Wasatch Fault, highlighting the likelihood that an earthquake will soon tear through the University of Utah campus. The seismic codes governing the design and construction of LNCO are dated to a decade prior to this study, and do not reflect such information. Looking ahead to future seismic events is a different beast than planning for other environmental changes. No amount of city, emergency, or household planning can possibly anticipate the disaster scenarios that will mushroom out of a major earthquake. The time of year, the exact size and location of the earthquake, the moisture in the soil, and the amount of people in the city can all change the circumstances of the seismic catastrophe for better or worse. The 1989 Loma Prieta earthquake hit the Bay Area during the World Series which probably saved many lives due to lightened traffic at the time of the quake. Imagine how different an earthquake scenario would play out in Salt Lake City when school is in session versus when it isn’t, during a winter storm, heatwave, or inversion, or during the Sundance Film Festival or convention when many people from out of town flock to the region. 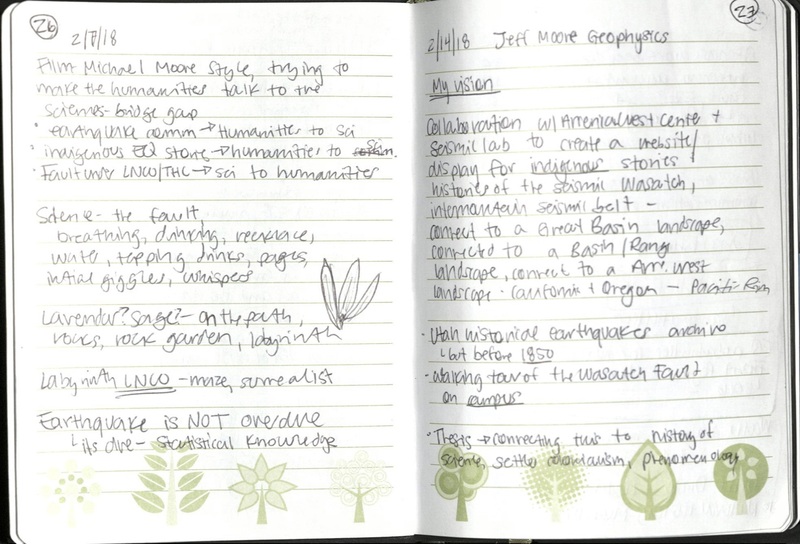 While the seismic hazards of the Wasatch present many problems for us to ponder and solve, the structures we build and the words that we say are important ways to communicate about, and perhaps also communicate with, the tectonic patterns of the earth. Especially in Salt Lake where earthquakes have yet to prove themselves to white settlers, the precarity of a site like LNCO illustrates the fragility of our relationship to deep time. 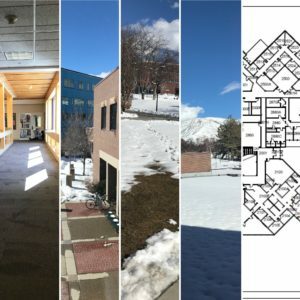 Over my year at the University of Utah, I’ve wandered through LNCO wondering how the twisting halls and hidden stairwells will look after the quake. 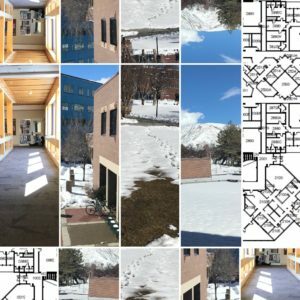 When I stand next to the Writing and Rhetoric department on the third floor and look out the window towards Red Butte Canyon, I think of how the scaffolding of the building beneath me relies on the stability of the slope. My view depends on the strata of architecture, engineering, soil, and bedrock below me, strata that physically uphold and sustain the mission of the university. However, the arrangement of these particular strata of LNCO, from the glass windows on the third floor down to the hot mantle rock deep below the surface that helps drive the basin from the range, threatens the integrity of the mundane academic systems nestled into the hill. At this dangerous juncture of human and tectonic systems, LNCO provides a toolbox to grapple culturally with the tensions and unconformities that arise when, as Rob Nixon writes, “we all inhabit multiple temporal orders that often coexist in frictional states, shifting and sliding like tectonic plates.” Writers, artists, and builders have long struggled to transcend the limits imposed by the ephemeral quality of time, from painting a fruit bowl that will never rot, to erecting monuments for the dead and divine, to passing on an ancient story to the next generation. To extend our experience and knowledge beyond our mortal lives, we’ve carved, crafted, excavated, erected, buried, built, sung, spoken, and written in hopes of sending messages about ourselves and our loved ones through vessels of our own creation into the future to be remembered, repeated, and celebrated by our progeny. Ancient epigraphs and contemporary memorials alike offer themselves – both materially and linguistically – as mnemonic devices for the purpose of sustaining a collective memory. Memory, remember, commemorate, memorial, and mnemonic are all Latinate derivatives relating to recollection and preservation of the dead, and stem from etymological constructions of “mind.” Also related to “mind” is the word “memento,” a cousin of the word “moment,” meaning a period of time with a distinct beginning and end. “Moment” is the basis for “momentum,” which denotes movement, revolution, and continual force. Etymologically, the human mind is deeply connected to time. This wordplay teaches us that differentiation between the temporal orders we take for granted – human time and seismic time, time as an arrow and time as a cycle – are blurred. As Katherine Schulz writes about earthquakes in the Pacific Northwest, “the brevity of our lives breeds a kind of temporal parochialism,” while the languages, architectures, and materials that we encounter in our short lives actually tie us deeply with eras, generations, and moments past. Language preserves cultural strata of the past in the routine substrate of our communication practices that we take for granted, just as the foundation of LNCO’s architecture unites my passage through a stairwell with the ancient sediments of Lake Bonneville and steep markings of past earthquakes. In LNCO, the present moment is constantly tugged forwards and backwards. New scholarship in language and communication rests on the literary and rhetorical traditions inherited from the past and forms the bedrock of the next generation’s inquiries. Every word spoken and every sentence written in LNCO is a deposition in the cultural record of meaning, which creates the future while being anchored in the past. These temporal contours retained in the scaffolding of our language resemble those of the seismic earth. The Wasatch Fault earthquake that shakes LNCO will be something utterly new and very old, both an unprecedented event for Salt Lake City and a repetition of an ancient pattern of tectonic movement, an intermingling of temporal orders.